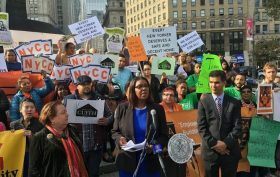 New York City Public Advocate Letitia James released this year’s annual “Worst Landlords Watchlist” Thursday at a tenants’ rights rally in lower Manhattan. The interactive database lists the top 100 building owners who have racked up the most violations (like rats, roaches and dirty elevators, to name just a few) relative to the number of buildings they own. This data is gathered from the Department of Buildings and Department of Housing. Three of the city’s five worst landlords according to the list have been on it for two years in a row. The top three offenders–Harry D. Silverstein, Allan Goldman, and Efstathios Valiotis–own buildings throughout the Bronx, Brooklyn, Manhattan and Queens. Silverstein received 2,032 HPD violations and 50 DOB violations over 575 units in eight buildings.